1. A collection of bodywork modalities designed to improve health through manual manipulation of soft tissues including stroking, kneading, pressing, tapping, and shaking. Intends to improve local circulation, reduce pain, and promote relaxation. Relaxation Massage is a smooth, gentle style of massage designed to de-stress and loosen up your body. The therapist uses slow strokes as well as light kneading and slight manipulations. This type of massage is a good choice for someone who is getting a massage for the first time, or someone who just wants to bring their stress level down. Multiple modalities or techniques can be used in therapeutic massage. A consultation with your therapist before your session will determine your specific needs. Below is a list of different disciplines we have been trained to use during our sessions. ~ Deep Tissue Massage is a form of bodywork that aims to relieve tension in the deeper layers of tissue in the body. Deep Tissue Massage is a highly effective method for releasing chronic stress areas due to misalignment, repetitive motions, and past lingering injuries. Due to the nature of the deep tissue work, open communication during the session is crucial to make sure you don't get too uncomfortable. Keep in mind that soreness is pretty common after the treatment, and that plenty of water should be ingested to aid with hydrating the soft tissue targeted during session. ~ Trigger Point Therapy is a style of bodywork that focuses on stimulating and releasing "trigger points" in your body. Trigger points are tender areas of tension similar to acupressure points, except they occur in the belly of the muscle rather than along the energy pathways of the body. These "knots" are built up throughout a person's life due to physical, mental, and/or emotional stress. During a session, focused pressure is applied through a variety of techniques order to release your trigger points. This process can be quite painful at times, yet the effects are lasting and profoundly transformative. 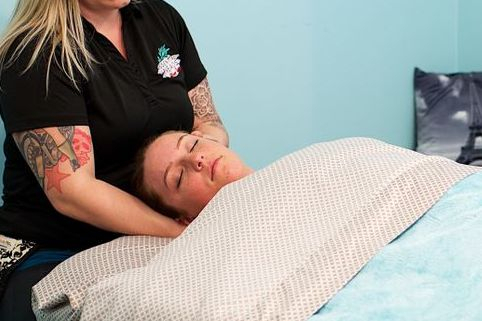 ~ Positional Release Therapy allows the massage therapist to first unwind tissue prior to manipulating it, making massage less painful and more effective, and its therapeutic effects longer-lasting. ~ Muscle Energy Technique is a form of stretching commonly used by sports massage therapists, which involves the active contraction of a muscle by the client against a resistive force provided by the therapist. ~ Orthopedic Massage uses anatomical science and a variety of body manipulation techniques to create measurable, meaningful impact in clients. It can be an excellent complementary treatment to physician or surgical care and physical therapy. ~ Sports Massage is a type of massage designed for highly active people who engage in athletics. Engaging in sports is harsh on the body and can often lead to injuries in both the short and long term. Sports Massage enhances performance and prolongs a sports career by helping to prevent injury, reduce pains and swelling in the body, relax the mind, increase flexibility, and dramatically improve recovery rates. Sports Massage is also highly effective in aiding the rapid recovery of an athlete from an injury by encouraging greater kinesthetic awareness and in turn promoting the body's natural immune function. ~ Cranial-Sacral Therapy is a gentle yet powerful technique that is effective in releasing neck pain, back pain, and mental stress (among other things). It does this by optimizing the movement of cerebrospinal fluid through the spine and around the skull. Developed by physician William Sutherland, this therapy provides a very soothing and relaxing healing experience. ~ Myofascial Release is a form of soft tissue therapy intended to eliminate pain, increase range of motion, and re-balance the entire body. It does this by using massage techniques to stretch the fascia and release the bonds that exist between the fascia, muscles and bones. Fascia is the connective tissue that connects and covers all muscles, organs, and skeletal structures of the body. Direct myofascial release is sometimes known as deep tissue work. Indirect release applies light pressure and gently stretches the fascia; this allows for increased blood circulation and relief from pain. ~ Swedish Massage is a very relaxing and therapeutic style of bodywork. It combines oils or lotion with an array of strokes such as rolling, kneading, and percussion to help the body improve its circulation. The benefits of this type of bodywork are wide-ranging and include relief from aches and pains, decreased stress levels in the body, enhanced mental clarity, improved appearance, and greater flexibility. This concentrated therapy can include the use of warming and cooling thermal treatments, RockBlades, RockPods, RockFloss, Cupping, Foam Rollers, Fascia Blasters, and/or RockTape to provide deep muscle pain relief, decrease inflammation and increase circulation. Renew and re-balance your body by removing toxins. Aids in the relief of arthritis, depression, psoriasis, chronic fatigue, fibromyalgia, and various other ailments. An incredible way to bring relief to your tired feet and legs, this foot treatment includes exfoliation and a foot massage utilizing some reflex points. It is excellent for relief of aches and pains. This treatment helps to balance water retention, stimulate lymphatic flow, and energize tired feet and legs. Chair massage is a popular way of relieving stress and releasing tension. In addition to the usual health benefits of massage, another benefit of chair massage is that it is done over the clothing. With seated massage, you can avoid the discomfort and awkwardness that you may feel in disrobing for a traditional massage. Also, chair massage sessions are usually shorter than traditional massage, making it convenient enough to fit into your busy schedule. Onsite Chair massage can be provided for various events in your office. We can also provide Sports massages at various sporting events. 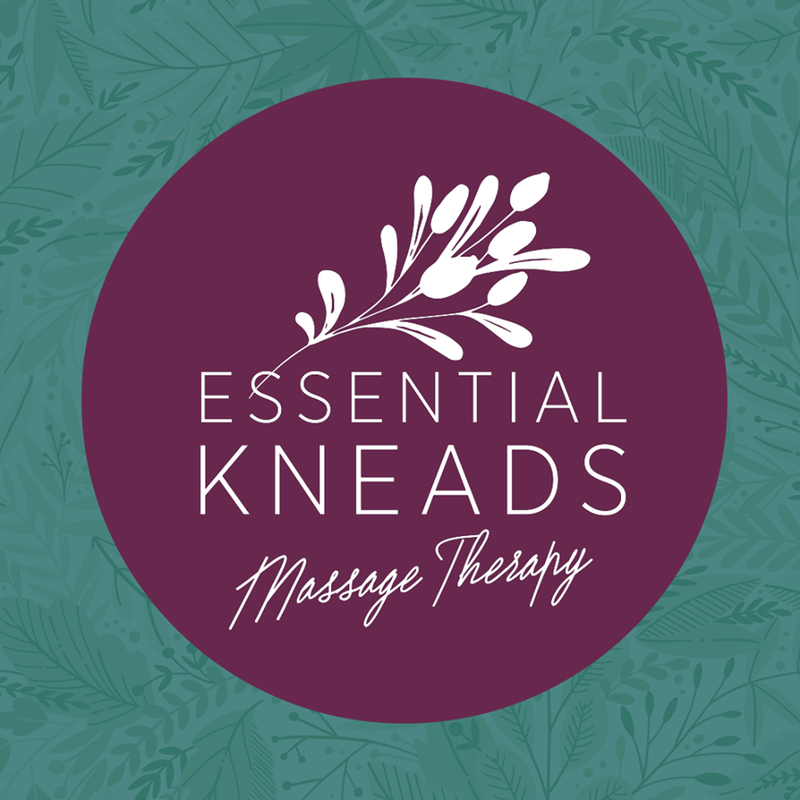 Email essentialkneadsmassageohio@gmail for a quote. Facial massage is a very popular treatment for pampering yourself but it is easily justified by some of its more practical benefits. To name a few; it can be used to detoxify the body, relieve stress, migraine headache, premenstrual syndrome (PMS) and sinus congestion. 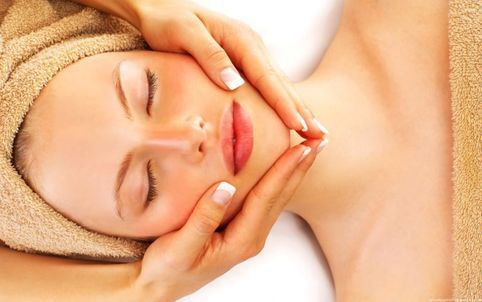 Although concentrating mainly on the face, facial massages often include massage of the the head, neck, and shoulders. Our Essential Kneads Signature Facial goes beyond traditional facial treatments, designed for total relaxation and skin rejuvenation. Suitable for all skin types, designed from your personal consultation, is tailored to your skin's needs. This specialized treatment promises to leave you utterly relaxed, harmonized, and balanced. You will leave with your skin looking refreshed and alive. Ashiatsu is an ancient art of massage from Asia. The therapist uses her feet to apply deep relaxing strokes and compression that feels exquisite. It is unique in its ability to maintain even and constant pressure to the entire body. Ashiatsu is great for those who participate in sports or have stressful lives. A couples massage is a wonderfully relaxing, personal experience. During the session, two people receive massages at the same time and in the same room from two different therapists. The therapy type used is typically Swedish massage but can vary depending on the client's needs or preference. A luxurious and over-indulgent service to enjoy side-by-side with whom you choose. This service is for couples, best friends, or for a mother/daughter experience. It includes a 60 minute Hot Stone Massage, 15 minute Facial Massage, delicious chocolates and fruit, and a complimentary glass of wine or champagne. This four-handed massage consists of two therapist working on the same client during the same session. Receiving a massage from two therapist during the same 1 hour session is just like receiving a 2 hour massage, that's a lot of bodywork! For now this service will be offered as a 1 hour service, the therapy type is usually a Swedish massage but can be changed depending on the client's preference. Thai massage is an ancient form of bodywork developed in Thailand with influences from India and China. A complete Thai massage will utilize a combination of many techniques and modalities including acupressure, energy line work (sen lines), joint mobilization and yoga-like stretching. This is a clothed massage done on a futon-like mat on the floor. Recipients will receive this profound form of body work in prone, supine, side-lying, and seated positions. Thai massage is also known as Nuad Boran (“ancient massage”) and Thai yoga massage. Reiki offers relief from both physical and emotional stress. The word Reiki is Japanese for “universal life energy” and is administered by the practitioner by placing their hands on the client in specific energetic areas. The popularity of Reiki has grown exponentially in the past few decades and is now even used in hospitals as part of treatment. Clients report relief from stress, headaches, insomnia, digestive pain, and even a decrease in pain from chronic illnesses such as fibromyalgia.